Photographer Randal Ford took on just such a task when he signed on with L.L. 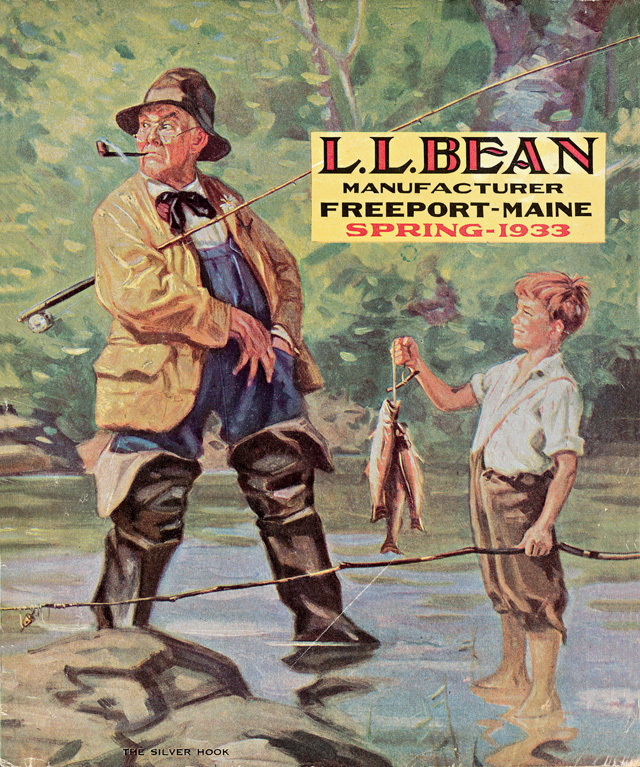 Bean to recreate the cover of their Spring 1933 catalog as part of L.L. Bean’s 100th anniversary celebration. A variation on an image that has appeared in angling art and literature a hundred times before, we all know this one about the kid who caught fish, using a stick and some worms, and the guy with the fly rod who buys them to pass off as his own. Recreating this image, in this way, only perpetuates the stereotype of anglers as fops and liars, but I don’t have nearly enough evidence to the contrary and must let it ride. What sticks in my craw is the fish. According to this article that appeared in the January 19, 2012, edition of the Wall Street Journal, photographer Ford insisted that the fish used for his photo not only be real, they also had to be alive, because he just knew stuffed fish would be easily spotted as fakes. L.L. Bean’s creative directors were able to identify the fish in the original artwork as Eastern Brook Trout and procured 14 of them from a local hatchery, along with a biologist and former game warden to keep them alive during the shoot. The fish were “lulled to sleep in a cooler” before being pulled out and photographed “in the 30 seconds to a minute before they awoke and began flopping about.” Of course, the fish (all 14!) unfortunately “expired” — which sometimes happens when you spend your morning being pulled in and out of a cooler and held up by a piece of string running through what passes for your lungs. But the important thing is that Mr. Ford got the shots he needed. The young boy’s outfit was returned to the costume shop at the Metropolitan Opera, the old man’s rod, reel, and waders were tucked back into Bean’s archives, and Randal Ford headed home to his computer, where, according to the video at the end of this post, he used Photoshop to “finesse” the image. No mere snapshot, this. Randal Ford has created a multi-layered fantasy of nostalgia, with a modern, digital twist. What was probably an impressively sharp photograph has been softened and muted, with the background pulled apart and set back, deep within its own layers, every leaf and needle of fir impeccably groomed, not a pixel out-of-place. The rock in the foreground occupies a space of its own, set in digitally rippled water that reflects the background almost too well and, in the middle of it all, it must have taken hours to finesse the heck out of the old man’s coat like that. Folds in clothing, bark on trees, freckles, hair, that silly tie, even the daisy in the old man’s button-hole; I don’t think a thing in this “photo” has gone untouched, and I could be very, very wrong on this, but I have a sneaking suspicion that also includes the fish. The fish that absolutely, positively, had to be real and alive so they wouldn’t look fake amongst all that fakery. The fish that died for Randal Ford’s art. I hope he at least served them up with a big batch of fiddleheads. For more on my feelings about the feelings of fish, please read my story Fishing Hurts. To this day I still prefer a decent illustration to a photograph. Something about the hand made rather than photographed has an appeal. Even a digitally altered rendition isn’t quite the same. That being said, the remake of the old cover isn’t half bad. I’m not buying the “needed live fish” argument though. With outdoor illustrators you can always tell when they have a love of drawing and painting and probably not much formal training. The give away is when they try to represent people. The Outdoorsman cover is a case in point. If that guy puts his arm down, his hand will fall below his knee. And the woman’s face is a hoot. I’m a big fan of illustrations, especially the old ones, but I agree with you about Ford’s recreation. It’s good. I don’t buy the need for live fish, either, especially considering all the manipulation that went into the image. 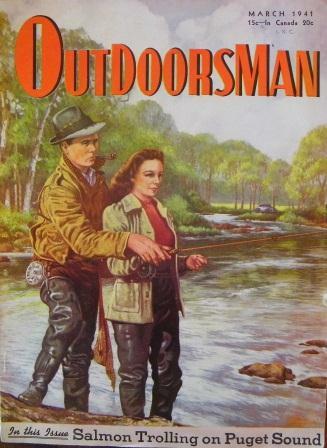 I never looked that closely at the Outdoorsman cover, but his arm is long, his hand is humongous, and yes, she is a hoot. I’m still keeping it on my wall but now it will never be the same. Well, call me old school. 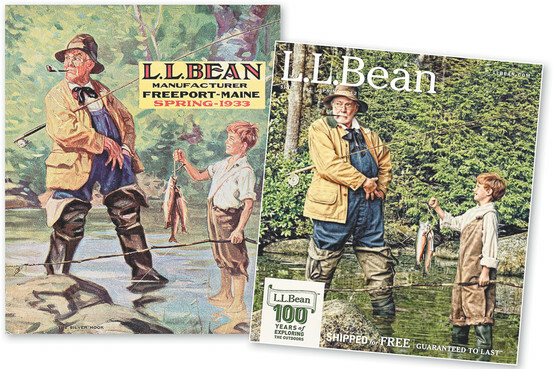 Although I like and respect LL Bean, I’m an illustration kind of guy. There’s no replacing that lost art. You are Old School. I’m with you. Great post, I always wonder about these things but never have time to look into them! I wouldn’t have given it a second thought until a friend sent me the Wall Street Journal link. I hope the time I saved you has been put to good use (fishing). You slipped in a gem of a thought, “Of course, if a similar image were to appear today, not only would it be a photo instead of a painting, but someone would probably be wearing a bikini.” And a true one at that. Somehow, women now allow themselves to be much more objectified than before we burned our bras. Go figure, eh? Women now don’t really know what’s gone on before, I guess. I’ve got something in the works about a team of guys in Speedos going around, representing the manufacturer of something-or-other at fly fishing events. I don’t think they are going to like it much. Dolly Parton says that when she burned her bra it took three days to put out the fire. What an enjoyable article! And of course the picture are great, too. I also love LLBean, and lots of what my husband and I wear comes from there. I know we’re not supposed to bring up the wild vs. hatchery trout argument here, but looking at those fish I’d say that the hatchery victims have definitely received the digital treatment for “wildness,” i.e., the flares of orange and other colors there don’t typically shine on fish that come from a can, even in fall. They look just a bit too pretty, don’t they? Of course, you’ve got an eye for nice brookies. Warren, your view of anglers is refreshing. Unusual, but refreshing. Thanks Quill for a great post. Loved it! 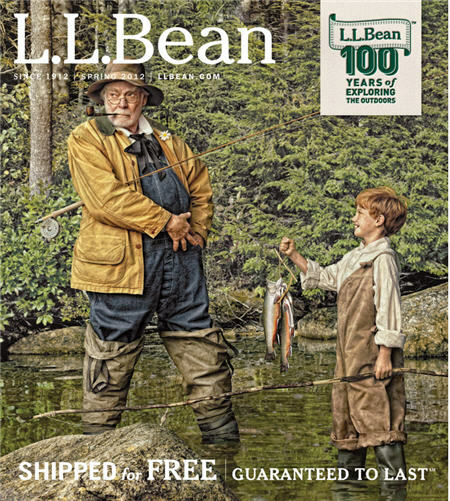 And also, thank you very much for mentioning that I’ll be tying at L L Bean on March 16 – 18. Appreciate that! What’s that, Don? You say you’ll be tying flies at L.L. Bean’s flagship store in Freeport, Maine, March 16-18? Man, I have to take one for the team down here and won’t be able to make it. I’ll explain later.